Paint a black base coat for the night sky. Paint some white on the makeup sponge and dab it onto your nail. You can dab the entire nail white or just portions of it. I did the entire nail for mine because the colours wouldn't show otherwise. I just regret not putting more white towards the edge of my cuticles. 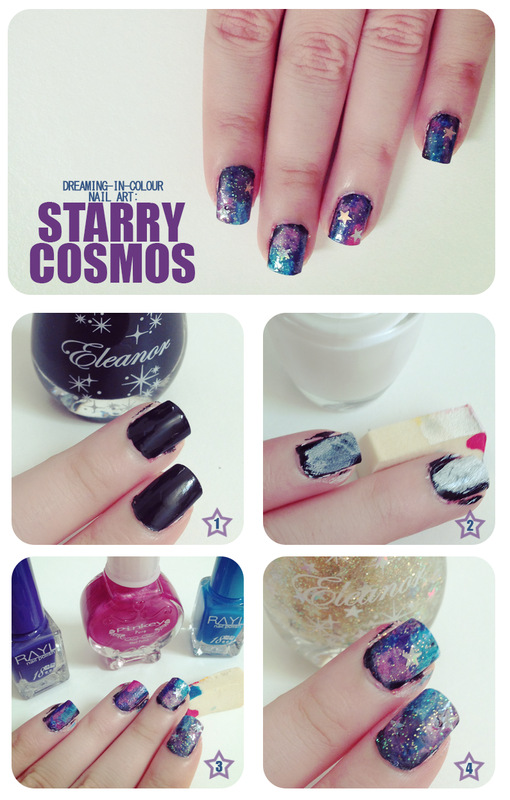 Using the colours you have chosen for your galaxy, paint them on the makeup sponge before transferring onto your nails. Spread the colours around and try to mix/blend them. I topped off mine with a transparent coat of glitter with stars. I bought this from sasa. thefaceshop also used to have one, but I'm not sure if they are still selling. I think this makes the galaxy effect prettier otherwise it'd look really plain. I'm really glad I did this. There're so many other nail arts that I want to try as well. I've found a bunch of cool instagram nail artists to follow and this nail art website is worth checking out too.